A population of 32,786 at the 2010 census. Only 17 miles (27 km) west from Boston, Natick is considered part of the Greater Boston area. Natick is home to miles eight through 12 of the Boston Marathon, with Framingham to the west and Wellesley to the east. Cognex, MathWorks, The Natick Army Labs, and the Natick Mall which includes residences, shopping & restaurants. Natick Center, which is also known as Downtown Natick, is located at the intersection of Central Street and Main Street and serves as the civic and cultural hub of the town. Most public services and public land use are located downtown. Municipal buildings like the Natick Town Hall, Natick Fire Department, Natick Police Department and Morse Library are located along East Central Street. 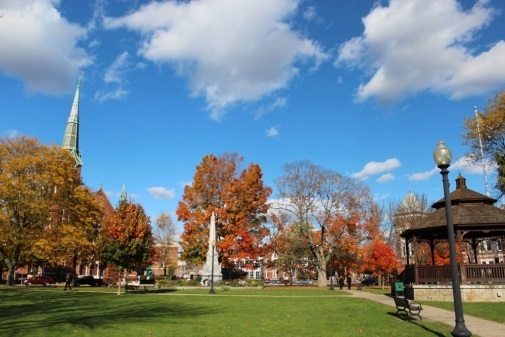 Also located directly downtown is the Natick Town Common where many town events and community activities are held such as the weekend farmers market and free concerts. Natick Center station, located in the downtown area, is served by the MBTA Commuter Rail Framingham/Worcester Line. In the 1990s new downtown construction of a town hall, fire/police station, and enlargement to the library gave the downtown a fresh new look. New municipal buildings exist alongside several historic buildings and churches, the restored Central Fire House, several banks, restaurants and small businesses. South Natick, known for its scenic nature, is where the Native American settlers first arrived and began the town on the shores of the Charles River. It's also home to the South Natick Falls. East Natick is a community of Natick that is located along Oak Street and at the intersection of Oak Street and Worcester Street. Notable landmarks include Jennings Pond, the Industrial Park on Oak St North, and the Lilja School. A sports and tennis club is located in East Natick off Oak St. in a part of the Industrial Park. The stretch of Route 9 in East Natick as one heads into Wellesley, contains a multitude of ever-changing retail businesses. West Natick is a large section of Natick that borders the town of Framingham. The Natick Mall, as well as the strip mall called Sherwood Plaza with its office Industrial Park behind, are considered to be the commercial hub of West Natick. In addition to its retail development, post World War II housing developments like Westfield, Pelham, and Sherwood, as well as the National Guard depot and a golf course on Speen St, brought many people to this part of town. There are many businesses in West Natick along West Central Street as well as another MBTA Commuter Rail station in addition to the one downtown. The area in West Natick, along Route 135 is the most densely populated section of town, with its thousands of condominiums and apartments clustered across the street from the train station.